To begin, you will need some dried elderberries as you don't want any moisture in the honey (in order to keep it shelf stable). You can purchase some here and will be able to make tinctures and other medicinal goodies with them so they won't go to waste (you will find our collection of elderberry recipes here). Note: If you choose to use fresh berries, the honey should last up to 6 months or longer if stored in the refrigerator. "... the berries contain many of the essential compounds as the flowers and are traditionally used as an anti-inflammatory to soothe coughs, sore throats, and bronchial infections and to make sinus conditions looser. Elderberry has powerful antiviral properties that combat various flu strains and have been shown to shorten the duration of flu attacks, so it is extremely useful for children and the elderly during the winter months." The other ingredient you will need is raw honey (local is best). It is not only tasty but anti-bacterial, anti-viral, and anti-fungal. Honey can reduce coughs and sooth sore throats, helps fight indigestion and contains a plethora of beneficial vitamins and minerals (more honey information is found here). And finally, it boasts an excellent shelf life! Important Note: Infants under 1 year should not be given honey. When paired together, raw honey and elderberry is a gentle immune booster for the body as the weather changes into the chillier months. Keep in mind that if you want a stronger medicine against the cold or flu, you will want to prepare a tincture. 1. Fill any sized (clean) jar that you choose, 1/4 of the way up with dried elderberries. 2. Pour raw honey over the berries and fill your jar all the way to the top. Cover with lid. 3. Set jar in a warm sunny spot for two weeks. If your honey is runny, you can flip your jar every few days to mix the berries through. If your honey is thick like mine was, you can simply stir the honey every few days to infuse the mixture. 4. When the two weeks are over, strain the berries. If your honey is runny, this will be easy. If your honey is thick, you will notice that all the berries float to the top and you can simply remove them with a spoon. Don't discard your precious elderberries (especially if you paid for the dried like we did)! Methinks they are not quite "spent" yet. Boil some water and prepare a large batch of tea with them (they will be sweetened already as they are coated with tasty honey). This will be a healthy drink for your family. You could serve it hot with some other herbal tea mixed in or you can serve it chilled with some ice. 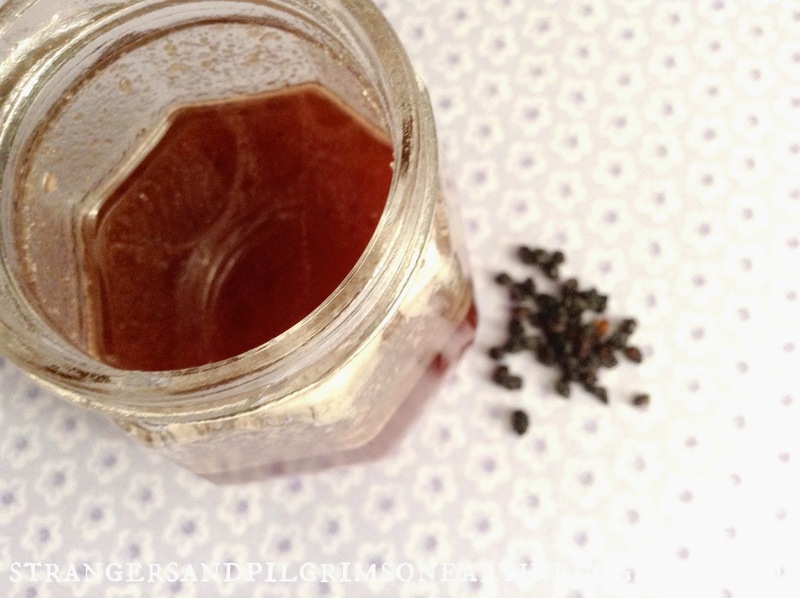 I used our leftover pieces to make an elderberry "scrap" syrup (see recipe here)! This herbal honey will keep in your pantry for many years. You can spread your herbal honey onto toast, drizzle over oatmeal, stir into yogurt, sweeten tea and lemonade with it or simply take a teaspoon a day! This would also make a nice get well gift for someone who is under the weather (our complimentary label is shared below). You can add a pretty tea cup and some herbal tea to complete the sweet sentiment. I don't know about you, but I love adding beneficial goods to my pantry and watching my winter provisions grow! It gives one that old fashioned pioneer feeling of preparing for the seasons ahead. We are sharing a printable recipe and label below (label will fit nicely on top of mason jar lid) that you may like to include in your herbal. 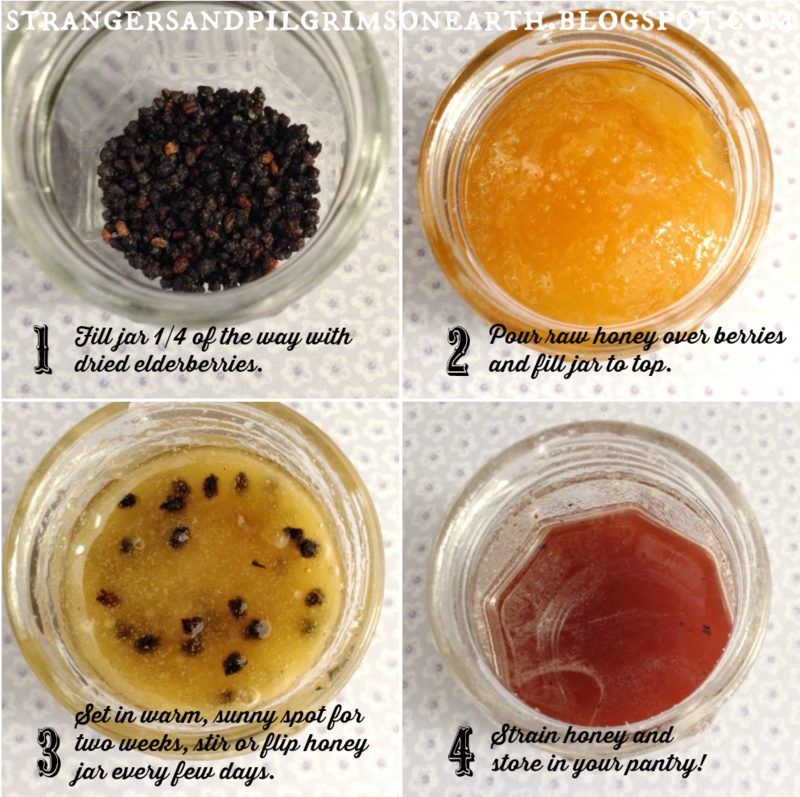 If you enjoyed this simple project, you may also be interested in making Pooh's Medicinal Honey or Elderberry Oxymel for an Herbal Soda Syrup. 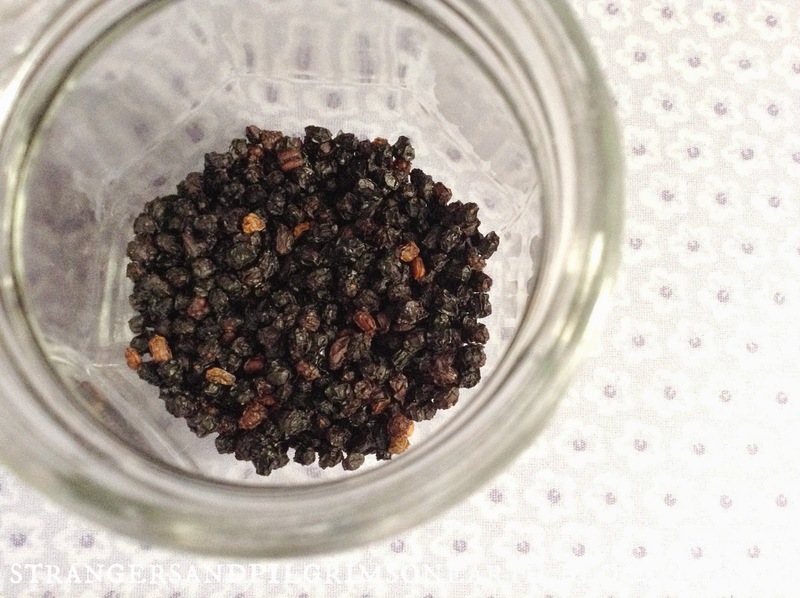 For our complete collection of DIY elderberry recipes, visit here! Disclaimer: I am not a doctor. While I do seek scientific confirmation of the safety and effectiveness of the herbs and remedies I use, remember that using remedies is a personal decision. Nothing I say on this blog is approved by the FDA or intended to diagnose, treat or prevent disease. All things on this blog are my opinion or the opinion of others. This post may be shared with some or all of the following link-ups: The Art of Home-Making Mondays, Modest Mom Monday's, Homestead Barn Hop, Amaze Me Monday, Monday's Musings, Marriage Monday, Titus 2sdays, Titus 2 Tuesdays, Tuesdays with a Twist, Raising Homemakers, Make Bake Create, Wise Woman Link Up, Wow Us Wednesdays, Wildcrafting Wednesday, The Scoop, Coffee and Conversation, So Much at Home, Homemaking Thursdays, Home Sweet Home, Hearts for Home Thursdays, Growing in Grace Thursdays, Home Acre Hop, From the Farm Blog Hop, Farmgirl Friday, Front Porch Friday Blog Hop, Simple Meals Friday, Cultivate Nourishing, Simply Natural Saturdays and Clever Chicks Blog Hop. Thank you lovely ladies for hosting these. What a great recipe ...and beautiful pics, thank you! :) I'll be making this today to have on hand for flu season! You are most welcome! It is so easy and therefore fun to make :) Happy kitchen-crafting! We have a wild elderberry bush growing in our yard right now loaded with berries, last fall we made jelly. Could I dry the berries myself first so honey would last longer? How would I dry them? I have a dehydrator I use for herbs but it has little holes berries might fall thru. This looks wonderful! Thanks so much - pinning it now. Love this post! I have honey and elderberries on hand and will put this together as soon as supper is over. We tried the syrup from Deep Roots At Home last year, and we really enjoyed it. I can't wait to use your recipe. Thanks so much for sharing your method and those beautiful labels. Have a great rest of the week! Great recipe! Thanks for sharing. You are most welcome Rita! Have a lovely week! 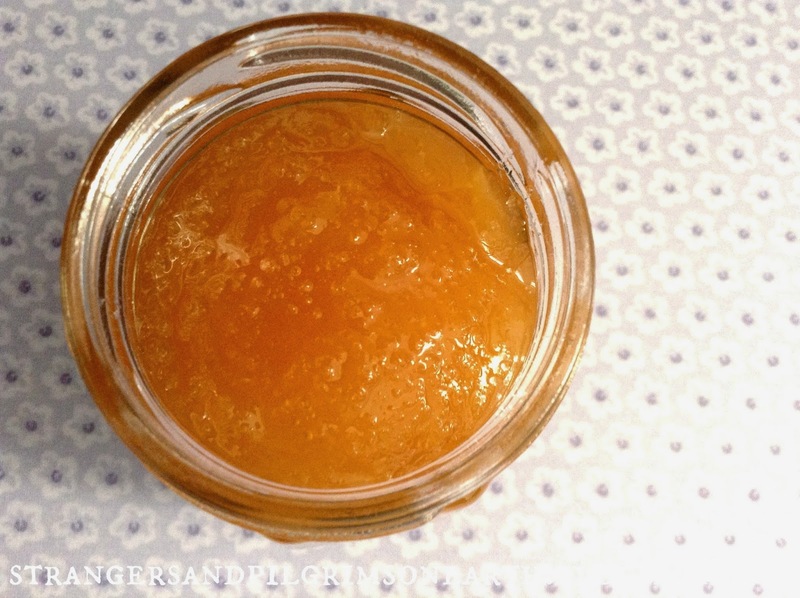 Lovely herbal honey recipe, great pics and invaluable info to protect ourselves from the upcoming seasons potential ailments, or simply enjoy every day! 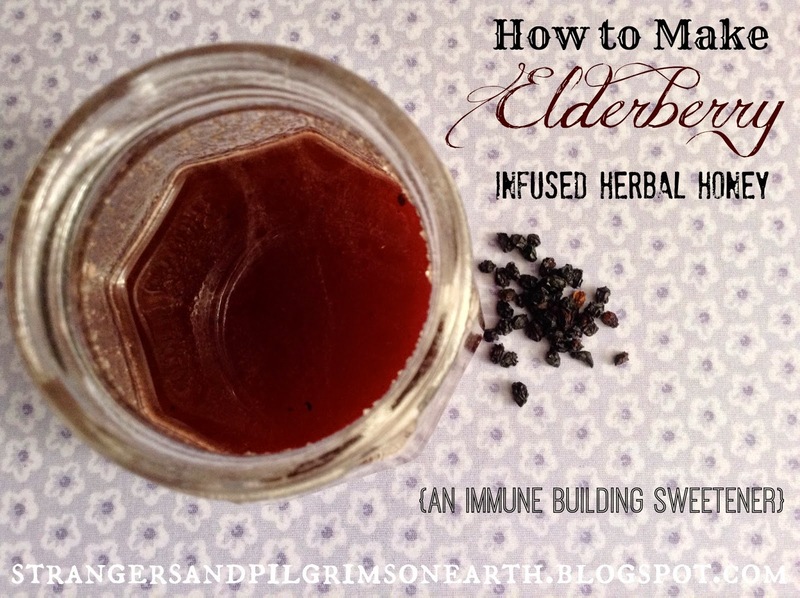 I love infusing my herbs in honey but it never dawned on me to use my elderberries! Genius, can't wait to give it a try, thanks for the inspiration. And thank you~ You were the one who inspired me about herbal honeys! I'm making this tomorrow. Thanks! Excellent! What is nice is that it is so easy so it is doable with our busy schedules :) Thanks for stopping by! I make homemade Elderberry Syrup, so I always have these ingredients on hand. I think I'm gonna have to make up some of this too. I love being able to infuse the elderberries with the honey. I'm all for the All-Natural way before I have to purchase anything store bought. Elderberry syrup is on my list too! And perfect that you have all the ingredients, it really is easy and tasty too :) Thanks for taking the time to comment Amy! My husband and I just discovered an elderberry bush growing on our mountain property! Last weekend I attended a class on herbal medicines for cold and flu season, and Elderberry Tonic was one of the items on the menu! Your recipe sounds great. I wonder how it would taste in tea? I can't wait to dabble in herbal medicines now. Thanks for your quick and sweet tutorial. This looks wonderful! A friend just gave me a bag of fresh elderberries. Can't wait to try this! This is fantastic, JES! 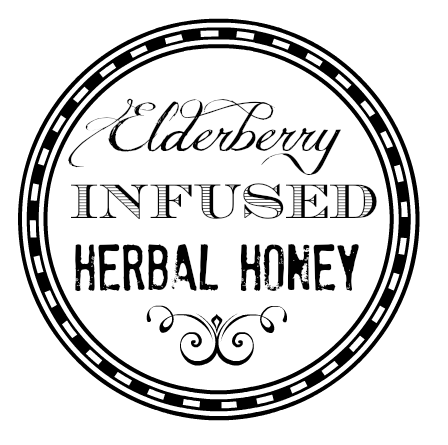 I must admit that I have never even heard of elderberry infused herbal honey :) I will definitely be trying this. Thank you for sharing and may you have a lovely day! What a great idea. I love that the honey infuses in the sun so it can still maintain the raw enzymes. Thanks for linking up at Simple Meals Friday! Exactly! And thank you for stopping by! Wonderful! :) Just keep in mind that it won't be as strong as the syrup. I understand it being hard to find ingredients as I have lived outside the U.S.. Learning to make do can be a rewarding challenge. I am sure you have some medicinal herbs in your area that you could try instead such as cinnamon or cloves perhaps :) Nice hearing from you and hope you have a lovely weekend! Hi! Just stopped by from the Homestead Barn Hop and I love this article. One of the things that I want to add to our property is some elderberry bushes. Thanks for a great way to get some immune boosters into our families! It always floors me when I hear of the many medicinal uses there are for honey, why do we buy all of those over the counter medications when honey works so well. Thanks for the great recipe. Love your recipe. I would be honored if you would come by and share at Foodie Fridays party this week starting Thursday 9pm EST. Hope to see you there! We LOVE Elderberry! Thanks for sharing! Hi there! No, it is not necessary to remove but it is easy since they do float to the top (and are surrounded by honey so they would brew a nice tea after if you like). I don't know how desirable they will be to eat, just try them when the honey is ready to see if you want them spread on your toast, etc. I am also going to freeze my leftovers to make a "scrap syrup" with after (since I want to use every last bit of the berries because I have to purchase mine)... Hope this helps! Have a lovely week! Sorry, I should have read through the comments before asking what to do with my elderberries. I ended up adding them to my banana bread recipe. Hi Kristina, don't be sorry! You didn't let them go to waste! How did that turn out by the way? I also mentioned in the post that a large batch of tea could be made with the strained berries too (and since honey is sticking to them, it is already sweetened :) Have a lovely week! Thank you Mimi :) We consume so much honey here, it makes sense to infuse it with an added punch.